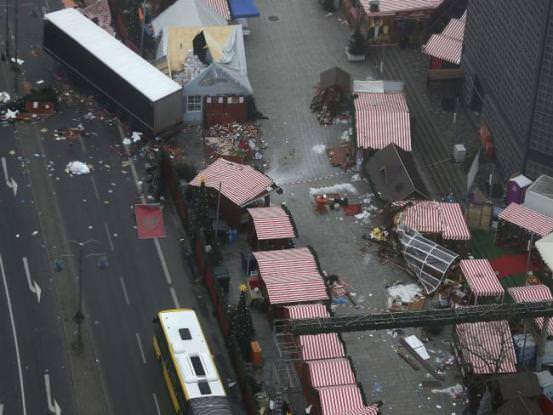 At least 12 people were killed this Monday and some 50 were injured when run over by a truck that has broken into a Christmas market in central Berlin. The City Police has indicated that the driver deliberately rammed the truck into the market. The Chancellor, Angela Merkel, herself described it as a “terrorist attack”. The German prosecutor’s office has indicated that it is not clear whether the attack was the work of one or more people and that no one has claimed responsibility for the crime. The incident occurred Monday around 20:15 o’clock, when the heavy vehicle invaded a pedestrian area in the Breitscheidplatz, commercial hub of the former western sector of the city. The truck covered approximately 50 meters of the traditional flea market and destroyed to its step positions of Christmas adornments and food stands, while it swept many visitors. A total of 48 people were injured, some of them seriously, and were transferred to various medical centers. The Berlin Police believe the suspect arrested after the attack is not responsible for it. “We have the wrong man”, said the police in the capital, in that, therefore, the true perpetrator of the attack would still to escape and could be dangerous. At a press conference with the mayor of Berlin, Klaus Kandt, the police chief of the capital, has stressed that “the checks are not over and we cannot confirm if the arrested was the driver of the truck”. In this sense, he said that we will proceed to analyze the fingerprints and the DNA samples that are in the truck to be able to determine this end. So far, Berlin police has confirmed in a message on Twitter that the only detainee, whom authorities have identified as a 23-year-old asylum seeker from Pakistan who arrived in the country in December 2015, denies the facts, something that has also been pointed out by the Federal Minister of the Interior, Thomas de Maiziere. It was reported that the young man was followed by a witness of the attack, who gave notice to the police. The Attorney General of Germany, Peter Franck, meanwhile has indicated that for now it is unclear whether the attack was the work of one or more persons. At a press conference, he clarified that for now there is no video claiming responsibility for the attack and acknowledged that currently depart from the base of that “the arrested person is not the perpetrator but not a definitive conclusion”. In this regard, he has appealed to “wait for results to arrive this afternoon or evening” of the tests. Inside the truck there was the body of a Polish truck driver, supposedly murdered by the perpetrator of attack. The truck, that was carrying steel beams, was stolen on Monday afternoon. The owner of the company, apparently cousin of the driver, was not able to contact him from 4:00 p.m. The security forces designed a comprehensive security device around the site and asked the Berliners to remain in their homes and leave the access roads for ambulances and fire engines vehicles.